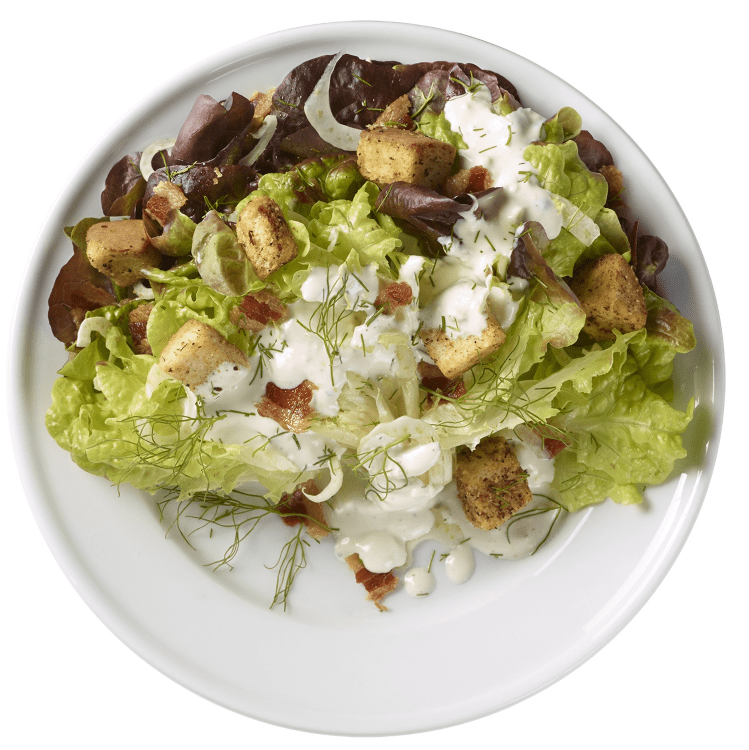 Tear a head of red Boston or Bibb lettuce in half and arrange on a plate. Mix dressing and spoon over lettuce. Sprinkle with bits of bacon, shaved fennel, minced fennel fronds, and fresh cracked black pepper. Top with Olivia’s Butter & Garlic Croutons. Mix dressing. 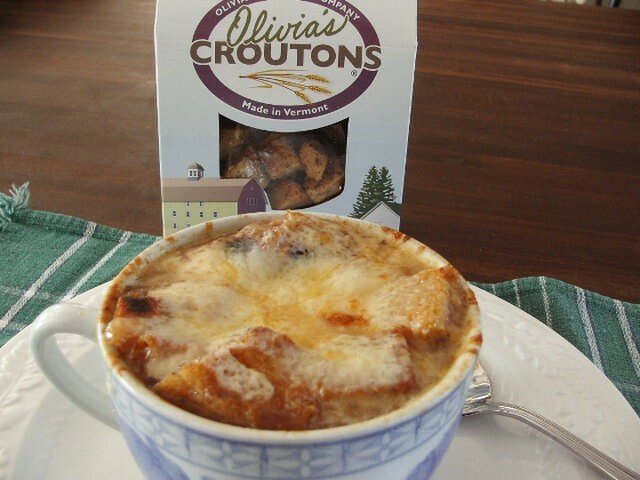 Add 1 box or 2 cups of Olivia’s Garlic & Herb Croutons and toss with dressing. Allow to rest in refrigerator for half an hour to soften croutons. 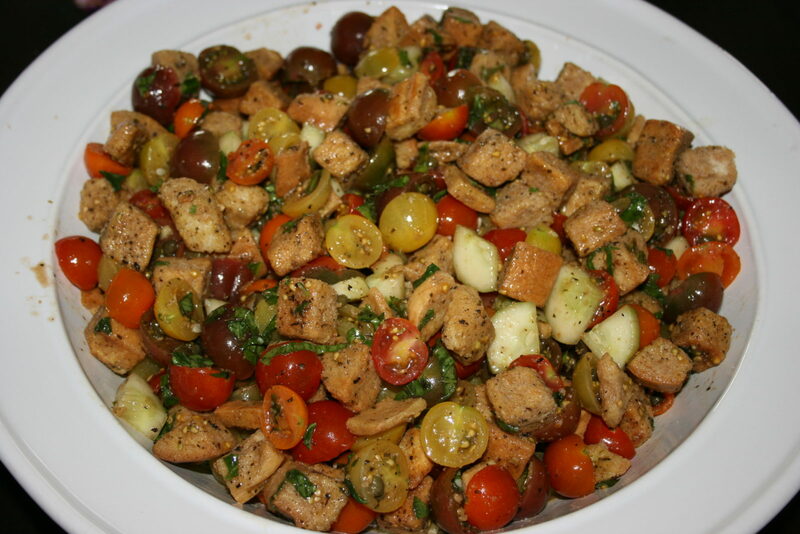 Mix together heirloom cherry tomatoes, chopped cucumbers, yellow peppers, thinly sliced red onion, pitted Kalamata olives (or capers), fresh mozzarella, and fresh basil, and add to softened croutons. Mix dressing and let rest to allow flavors to meld. 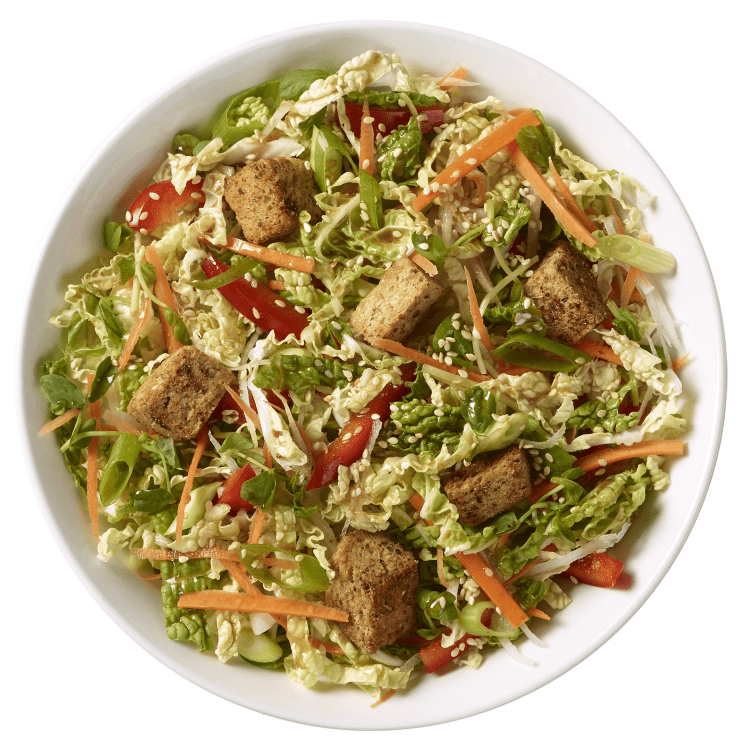 Combine shredded Napa cabbage, pea shoots, shaved daikon, and julienned carrots, and red peppers. Add Olivia’s Hearty Whole Grain Croutons. Toss with dressing and top with diced scallions and sesame seeds. Start with fresh kale or baby kale leaves. If you use mature kale leaves, remove coarse stems and chop. Place chopped kale in a plastic bag and drizzle with extra virgin olive oil. 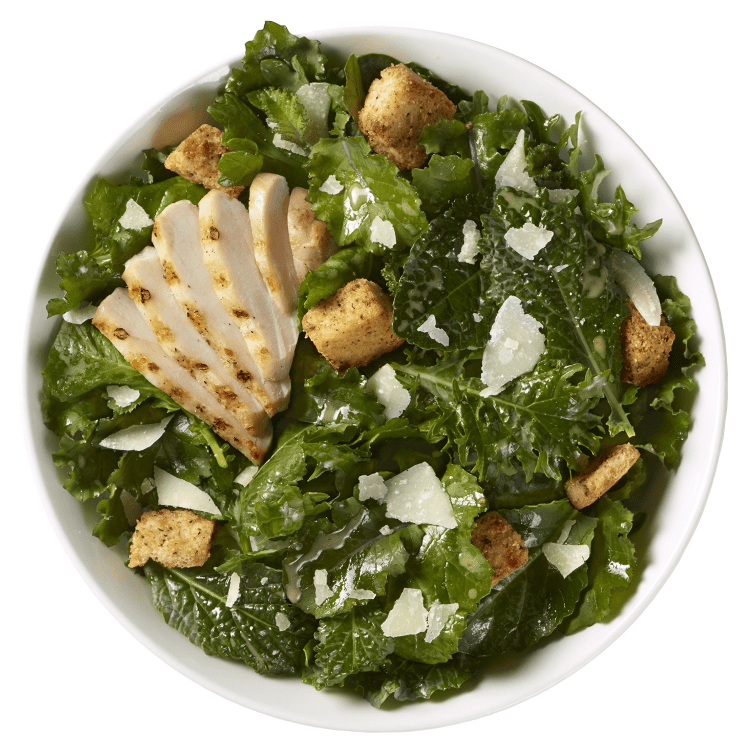 Close the bag, massage and shake it for a few minutes, then let the kale rest while you make the dressing. When ready to assemble, add pieces of grilled chicken, shavings of good quality, Parmesan cheese, and Olivia’s Parmesan Pepper Croutons. Add dressing and toss generously. Add additional shavings of Parmesan and serve. 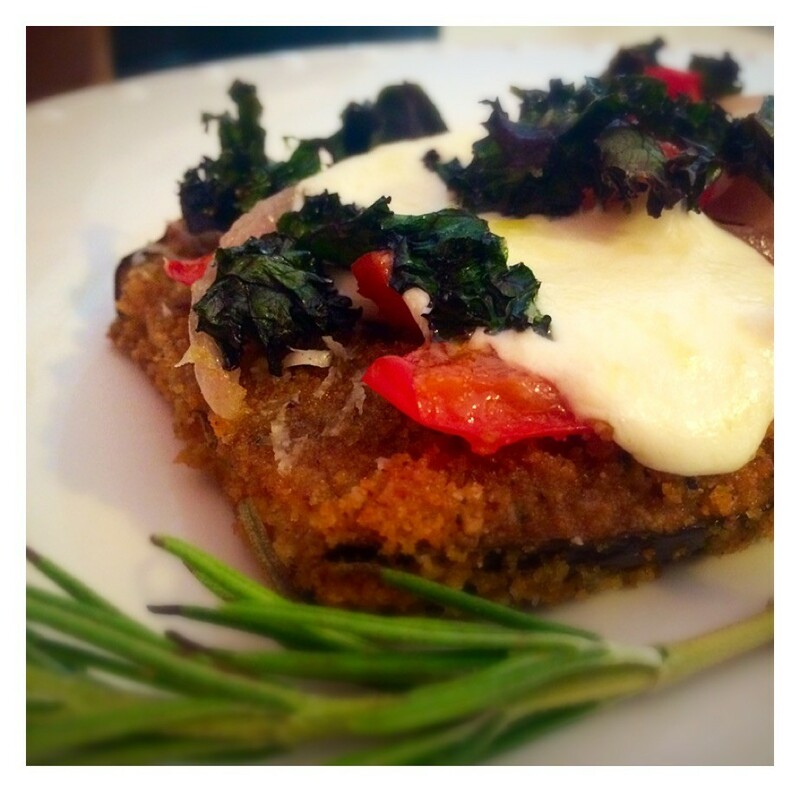 Rachel Ray did it first and it was such a no brainer…(Stuffing in the shape of a muffin) lots of extra crispy parts. I really love sausage and mushrooms in my stuffing. 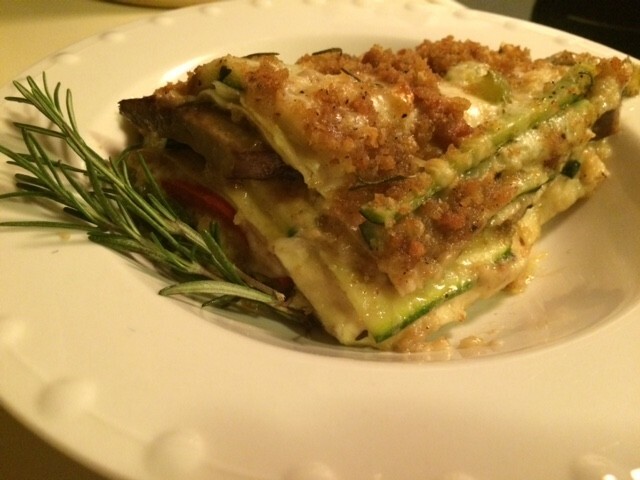 I created this recipe just for me, but I’m willing to share! It’s so yummy. In a medium sized skillet, cook breakfast sausage. Break into small pieces as it is cooking. When cooked through remove to a plate and drain fat. While sausage is cooking chop celery, onion and mushroom. In a large sized skillet melt butter. Add celery, onion and mushrooms and sauté until tender. Add cooked sausage. Add chicken broth and warm. Remove skillet from heat and add Olivia’s stuffing mix. Let stand 10-15 minutes to allow broth to soften stuffing cubes. While stuffing is resting, grease 12 piece muffin tin. 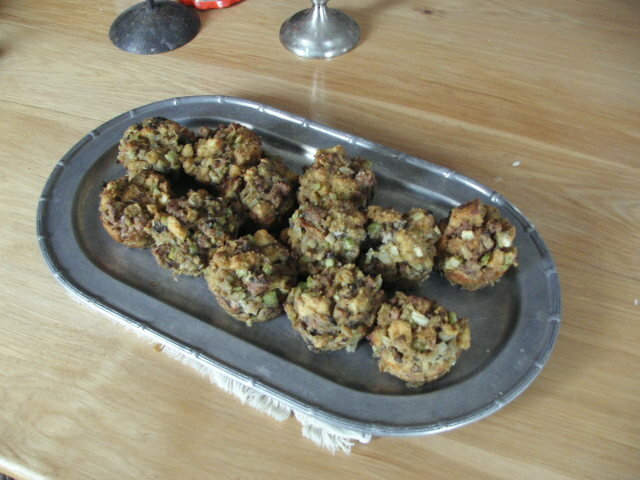 When stuffing mixture has softened, taste and adjust seasoning if needed. Add beaten eggs and stir gently. Spoon stuffing mixture into muffin tins, packing gently and mounding over the top. Bake in a 375 degree oven for 25 minutes. Remove muffins from tins and serve. Leftovers are great sliced and toasted and topped with leftover gravy. In a large skillet or Dutch Oven heat oil over medium – medium high heat. Cut onions into thick rings (about 1/2 inch). Create dredging station (1 bowl flour, 1 bowl eggs whisked, 1 bowl crushed croutons). Toss onion rings in flour, then dip into egg, coat in crushed croutons. Place 5-8 rings into hot oil, cook until golden brown (approximately 1 -2 minutes). 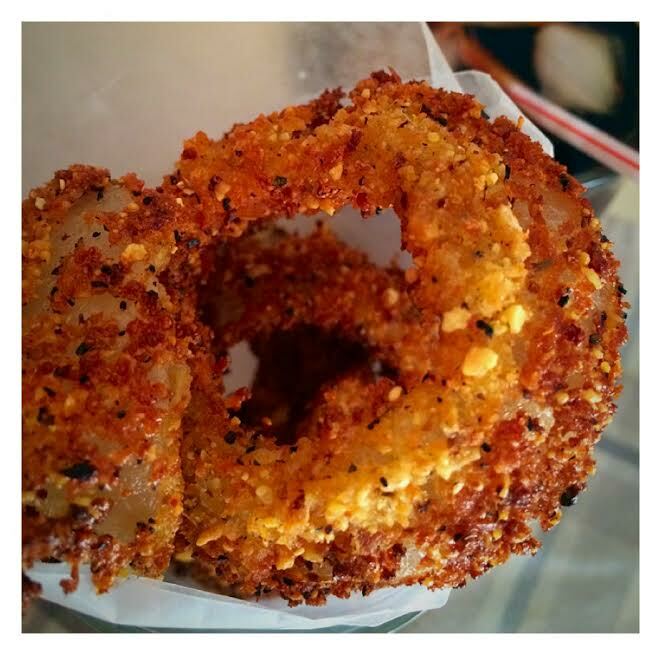 Repeat until all onion rings have been fried. 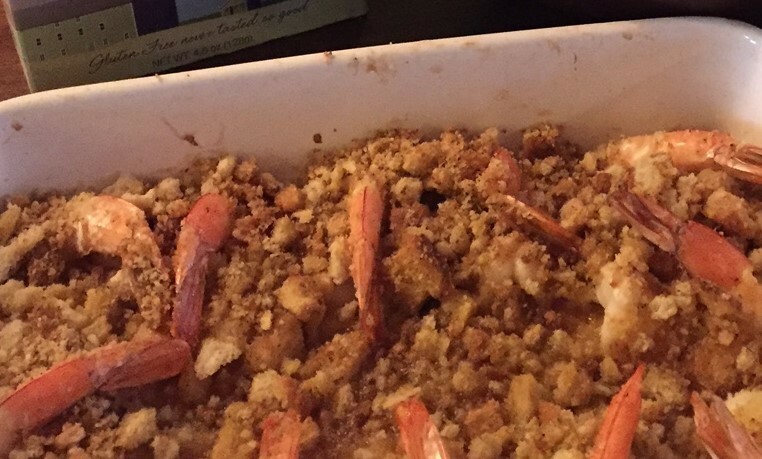 Arrange shrimp (tails up and butterflied portion spread out) in baking dish brushed with butter. Season with salt and pepper. Drizzle melted butter, lemon juice, and garlic over shrimp. Sprinkle crushed croutons on top, bake at 425 for 10-12 minutes. Yum! 1/2 pound grated Gruyere, Parmesan, or cheese of your choice. Melt the stick of butter in a large pot over medium heat. Add the onions, garlic, herbs, salt and pepper. Cook until the onions are very soft and caramelized, about 25 minutes. Add the wine, Worcestershire and Balsamic vinegar, bring to a boil, reduce the heat and simmer until the liquid has evaporated and the onions are thick. Remove the bay leaves. Turn the heat down to medium low and add the beef broth, bring the soup back to a simmer, and cook for 20 minutes. Season with salt and pepper if desired. When you’re ready to eat, preheat the broiler. Ladle the soup into ovenproof bowls. Arrange 5 or 6 croutons on top of the soup and cover with a handful of cheese. Place bowls on a sheet pan on middle rack of the oven and broil until cheese is brown and bubbling about 5 minutes. Remove from oven and let cool slightly before eating. Enjoy!